Ref. 3440 ?Yellow? 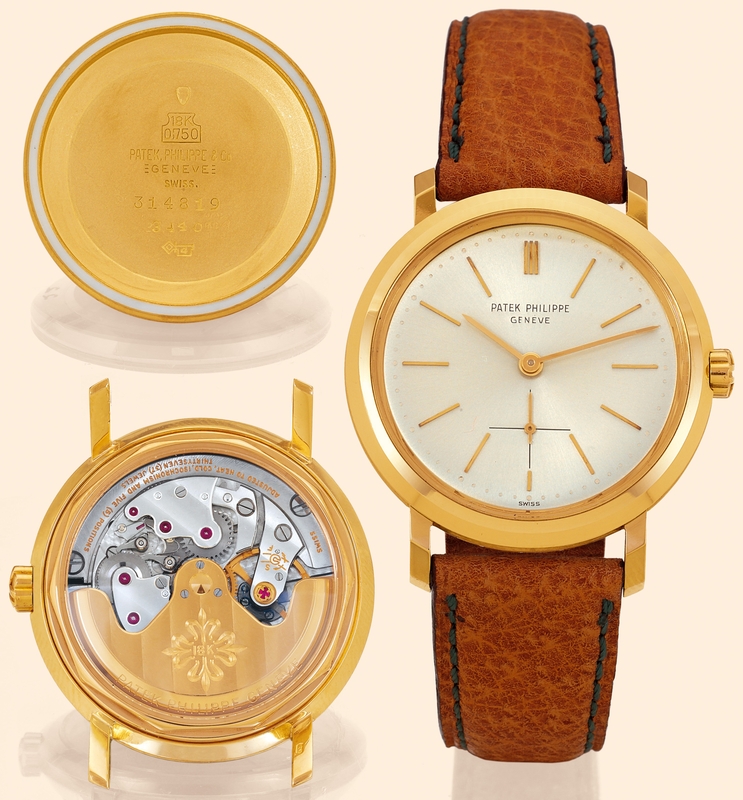 Patek Philippe & Cie, Genève, No. 1113585, case No. 314819, Ref. 3440. Made in 1963, sold on May 8, 1964. Very fine and very rare, self-winding, water-resistant, 18K yellow gold gentleman's wristwatch with transparent back and an additional solid gold back. Accompanied by the Extract from the Archives. C. Two-body, solid, polished and brushed, screwed-down transparent case back, sloped bezel, lapidated straight lugs. D. "Satiné" silver with applied yellow gold baton indexes, outer minute division, subsidiary seconds dial. Yellow gold "bâton" hands. M. Cal. 27-460, stamped twice with the Seal of Geneva Quality Hallmark, rhodium plated, "fausses côtes" decoration, 37 jewels, straight line lever escapement, Gyromax balance adjusted to heat, cold, isochronism and five positions, shockabsorber, self-compensating free-sprung Breguet balancespring, 18K gold rotor. Dial, case and movement signed. Diam. 34 mm. Thickness 10 mm. C. Two-body, solid, polished and brushed, screwed-down transparent case back, sloped bezel, lapidated straight lugs. D. "Satiné" silver with applied yellow gold baton indexes, outer minute division, subsidiary seconds dial. Yellow gold "bâton" hands. M. Cal. 27-460, stamped twice with the Seal of Geneva Quality Hallmark, rhodium plated, "fausses côtes" decoration, 37 jewels, straight line lever escapement, Gyromax balance adjusted to heat, cold, isochronism and five positions, shockabsorber, self-compensating free-sprung Breguet balancespring, 18K gold rotor. Dial, case and movement signed. Diam. 34 mm. Thickness 10 mm.